Chain Openers for Garage Doors | Denver Repair | Affordable Door Co. 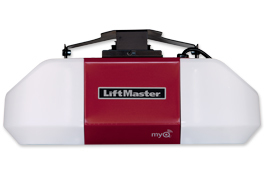 This garage door opener provides maximum power for the heaviest garage doors, including carriage house and solid wood. It easily lifts heavy doors while steel reinforced belts allow quiet and smooth performance. Status alerts can be received as an email or pop-up on your mobile device. MyQ mobile app is a free app that requires no annual activation fee. Contact the experts at Affordable Door for additional information.